The number of apps out there for period monitoring are legion, which is as it should be. It’s an important part of health. And it took me shamefully long to discover them — I had my iPhone for almost two years before I downloaded my first tracker app. There are specialized apps — for example, FitrWoman, a period tracker for athletes. But basic apps monitoring cycles and symptoms are all the average woman will ever need. With that in mind, here are the free period-tracking apps I’d recommend. Clue is more neutral, thankfully, than some of the other offerings. It doesn’t present your reproductive info with a shower of flower petals and pink mist. It’s red, blue, green, and white. It’s as simplistic and straightforward as a pile of alphabet blocks, or a complex as a medical chart depending on how you use it. Clue is fully integrated with Apple Health, which makes it optimal for iOS users who use the catch-all fitness app. It’s also available for Android. Where apps like Clue are the straightlaced whiteboards of period tracker apps, Eve is more like a wall covered in stickers. It reminds you of your cycles in emoji-laced notifications, and every log is a colorful drawing rather than plain old text. There’s also an encyclopedia of information on things like birth control. For some people (me included), it might seem a little too precious to have all the reactions be pictures. But if you like having a health app with personality, Eve will provide. It’s available on iOS and Android. 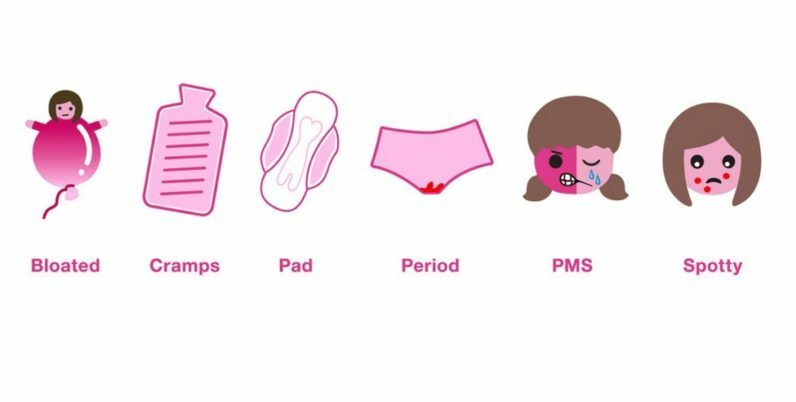 In case you couldn’t already tell, I’m kind of allergic to period apps that are all pink flowers. Flo straddles the line between being like this, and being closer to Clue’s primary colors. It seems like a simple aesthetic choice, but aesthetics matter in an app you might have to use several times a month. Flo’s also a more toned-down version of the light-hearted Eve. Symptoms and such are still depicted in pictures, rather than text, but it’s more sober than the latter app. Also, it’s passcode-protected for those who prefer to keep private matters private. It’s available for iOS and Android. If you don’t have time for the circles and frills of other apps, then a simple calendar is your best bet. Period Tracker is a straightforward calendar where you can add everything by day. Granted, it can end up looking like the world’s most detailed day planner, but — as someone who actually uses a day planner — that works for some people. There’s a Deluxe paid version, though I honestly couldn’t tell you what the difference between that and the free version, as both seem to handle the basic info in which I’m interested. Both are available for iOS and Android. Pink Pad has something the other apps don’t: an emphasis on community. The app’s journal-like design and bright colors are appealing, but not especially unique. Its social network-like qualities are what set it apart. You can ask your fellow members questions regarding reproductive health, share stories, and give advice. That’s refreshing when it comes to something that is usually talked about in more hushed, borderline shameful tones in person (at least in my experience). It’s available for iOS and Android.